Significant improvements will be made over the next two years to the New York City’s outdated bus system, Mayor Bill de Blasio is expected to announce during his State of the City address on Thursday. A report released by City Comptroller Scott Stringer in 2017 found the city’s buses run at the slowest pace in the nation among large cities, traveling at just 7.4 miles per hour on average. 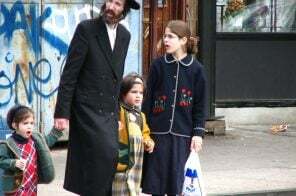 The mayor aims to increase the bus speeds by 25 percent to just over 9 miles per hour by the end of 2020, as amNY first reported. Feeling whimsical? Holiday Nostalgia rides are back this season, with vintage train cars and buses replacing regular service through New Year’s. 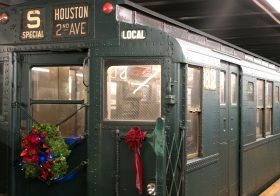 The New York Transit Museum invites New Yorkers and visitors alike to celebrate the magic of the city during the holidays with train rides that run along the F line from 6th Avenue to 47th-50th-Rockefeller Center, with stops at stations like Columbus Circle and 125th Street, all spots known for being major holiday shopping centers. Bad news for bus riders. 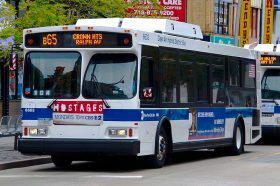 The Metropolitan Transportation Authority will not expand select bus service over the next few years as originally planned in order to cut costs amid a looming financial crisis for the agency, the Wall Street Journal reported on Tuesday. Mayor Bill de Blasio first announced last year a plan to expand the select, or express, bus routes by upgrading 21 new routes over the next decade. But the MTA said it can save $28 million through 2022 by postponing the program temporarily. It happens on every holiday, but a midweek July 4th promises to add an extra layer of confusion to the tourists, crowds and screwy schedules that will inevitably hit the city’s public transit system. 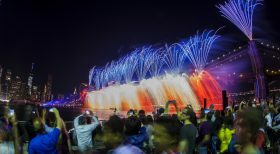 We hope we can help you get your itinerary dialed in by giving you the low-down on changes to NYC subway, bus and ferry service on the 4th, so you can get to and from that optimal spot to watch the fireworks. The good news: The MTA will be offering extra rail service on Tuesday, July 3 and Wednesday, July 4. The possibly good/bad/mixed news: The MTA’s railroads, subways and buses will operate on weekend schedules…and then some. 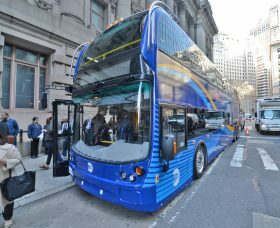 They’ll be blue instead of red, but just like London, NYC will soon have double-decker buses cruising down its streets. 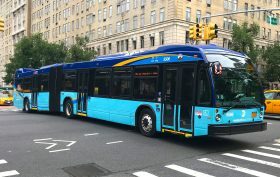 As part of New York City Transit head Andy Byford’s larger bus-improvement plan, the MTA will start testing its first two-story bus on Staten Island today, and if all goes well, they’ll roll out on express routes in Manhattan soon. And to go along with the new design is a mobile app that provides seat availability information on express buses. Is “eternity” really a viable measuring unit when describing how long it takes to get to your destination via New York City bus? The MTA has created a new and unique bus performance dashboard that details customer-focused performance metrics for the city’s bus routes, which, as 6sqft recently reported, are considered among the country’s slowest. This new method of compiling and viewing data is part of the MTA’s plan to improve bus service across the city, and according to the MTA, no other transit system in the world offers the same level of detail in an online dashboard. 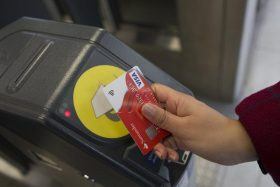 The MTA’s new cardless fare system will completely phase out the MetroCard by 2023, and transit advocates from the TransitCenter and the Tri-State Transportation Campaign believe there’s more to gain here than strictly streamlining the swiping process. In a report released this week titled “A New Way to Ride,” the groups outline three main policy opportunities available through the new fare system–seamless bus boarding, fare capping, and enhanced service information–all of which have been implemented in other cities with similar payment technology. Among large cities, New York City’s bus system runs at the slowest pace in the nation, traveling at just 7.4 miles per hour, according to a report released by City Comptroller Scott Stringer on Monday. Due to an outdated fleet, inefficient routes and buses running at near-crawling speeds, the system lost 100 million passengers over the last eight years. And while it serves more than two million passengers each day, more than the daily ridership of LIRR, MetroNorth, PATH and NJ Transit combined, the Metropolitan Transportation Authority has largely ignored the system’s failures. In his report, Stringer urges the MTA and city to better coordinate to address the bus system’s crisis and lists 19 recommendations, which includes updating routes, replacing old buses and introducing all-door boarding and tap-and-go fare payment options. A new before-and-after study shows that in New York City thousands of potential bus rides are likely happening by bike instead, reports CityLab. 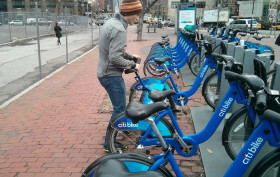 Recent research published in a new journal article on bike sharing stations along city bus routes, by Kayleigh Campbell and Candace Brakewood, an assistant professor of civil engineering at the City College of New York, revealed that for every thousand Citi Bike docks situated along Brooklyn and Manhattan bus routes, bus trips dropped by 2.42 percent. The study includes trips made between May 2012 and July 2014 and controls for a wide variety of factors in order to show the impact of bike sharing on bus ridership. In recognition of Earth Week, Governor Cuomo announced a new pilot program to bring electric buses to New York City this year. 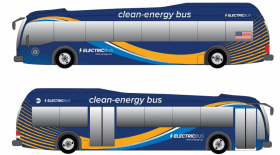 The MTA board has approved to lease the first five electric buses, and the lease for the next five will be presented later this year. The program will cost $4 million for three-year leases, which includes six depot charging stations. A charging station will be located at the Grand Avenue Depot in Maspeth, where buses will charge overnight. The first leg of the pilot will also include one “en-route” charging station at the Williamsburg Bridge Plaza in Brooklyn, which will serve as the hub for nine routes.